The in-direct alternative to this production method is using anti-freeze instead of water. Once the sun has warmed this liquid, the heat gained from this process is transferred to water held in a tank. Currently, this is the most popular form of solar panel available on the market today. PV modules are made up of specially coated silicon cells. As sunlight falls on these cells electrons move from one side of the silicon to the other and an electrical current is produced. The more cells there are the more current is generated. The electricity generated by the PV modules is converted from DC to AC by an inverter and connected to your consumer unit. The electricity flows to wherever it is needed to power your home. At times when there is more electricity being generated than is needed it will flow out through a meter into the grid. The meter records total electricity generated by the system. When demand for electricity in the house is greater than that being generated by the panels, electricity is drawn from the grid in the normal way so you will never be without electricity. There are no moving parts to wear out, with the system working completely silently. The leading component manufacturers that we deal with offer lengthy guarantees, typically from around 5 years but these vary from manufacturer to manufacturer. Our in house control processes ensure we specify and fit the appropriate system for your circumstances. 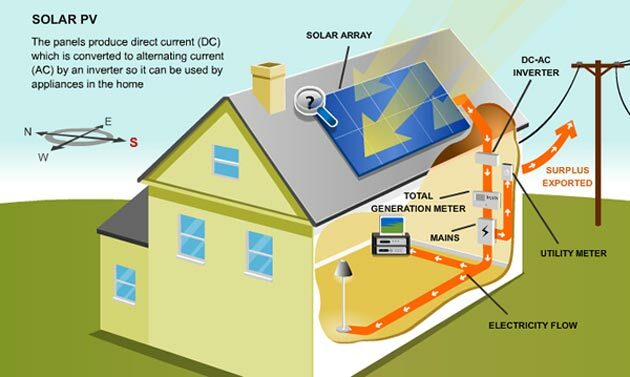 Photovoltaic systems do not need bright sunshine to generate electricity. However they do generate more in summer than winter due to there being more hours of brighter sunlight. The orientation of the panels is important-the closer they are to south facing, the more energy will be generated. The optimum angle of inclination is between 30 and 45 degrees. Our on site surveyor will establish whatâ€™s best for you. Heat your home with energy absorbed from the air around you. Air source heat pumps absorb heat from the outside air This is usually used to heat radiators, underfloor heating systems, or warm air convectors and hot water in your home. 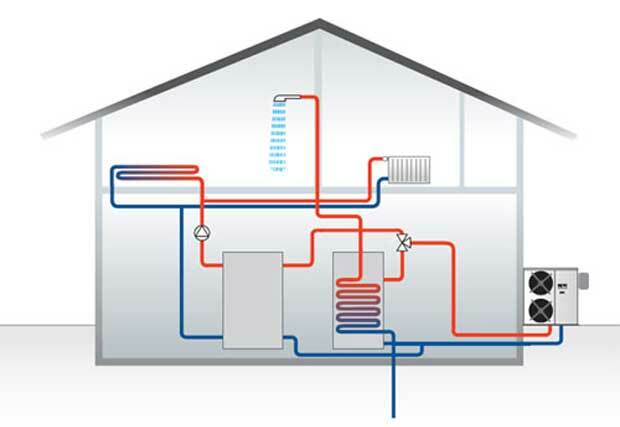 An air source heat pump extracts heat from the outside air in the same way that a fridge extracts heat from its inside. It can extract heat from the air even when the outside temperature is as low as minus 15Â° C.
1 – An air-to-water system distributes heat via your wet central heating system. Heat pumps work much more efficiently at a lower temperature than a standard boiler system would. So they are more suitable for underfloor heating systems or larger radiators, which give out heat at lower temperatures over longer periods of time. 2Â -Â An air-to-air system produces warm air which is circulated by fans to heat your home. They are unlikely to provide you with hot water as well. Heat from the air is absorbed into a fluid which is pumped through a heat exchanger in the heat pump. Low grade heat is then extracted by the refrigeration system and, after passing through the heat pump compressor, is concentrated into a higher temperature useful heat capable of heating water for the heating and hot water circuits of the house. If youâ€™d like to generate your own energy from renewable resources, financial incentives are available through various government funded programmes. Clean energy cash back schemes such as Feed in Tariffs are in place for electricity generating technologies such as solar electricity (PV). What are â€˜feed in tariffsâ€™? The feed in tariff was introduced in April 20l0 to encourage local generation of electricity from a wide range of technologies. Here we are concerned with the benefits of the feed in tariff for solar photovoltaic installations. Owners of qualifying installations will receive income from their electricity supplier based on the amount of electricity they generate and the amount exported to the grid. The feed in tariff rate for the total electricity generated depends upon whether the installation is in a new build property or is being retrofitted onto an already built property and is also related to the total rated output of the system installed. This payment is guaranteed for 25 years and linked to RPI* for 25 years. We do not believe there are many better investments than this! The power exported to the grid can be sold at a minimum price of 3p a unit or you are free to negotiate a contract price with your electricity provider. Some of the UKâ€™s leading insurance companies, Diocese of Chelmsford and London, Estuary Housing, EAGA, Kier group, N power and Domestic and General among others. We are proud of our reputation as an established reliable company. With over 30 years experience Alan Rogers, started the company in 2001.